For both of the example I used the new Distress Oxide Spray in — Spiced Marmalade. However, for the first example I sprayed a white card panel that I lined up with the Triangle Blast stencil to create the triangles. Once the stencil was all cover it up with the distressed spray I carefully removed the stencil from the card panel, and I set it aside to dry. 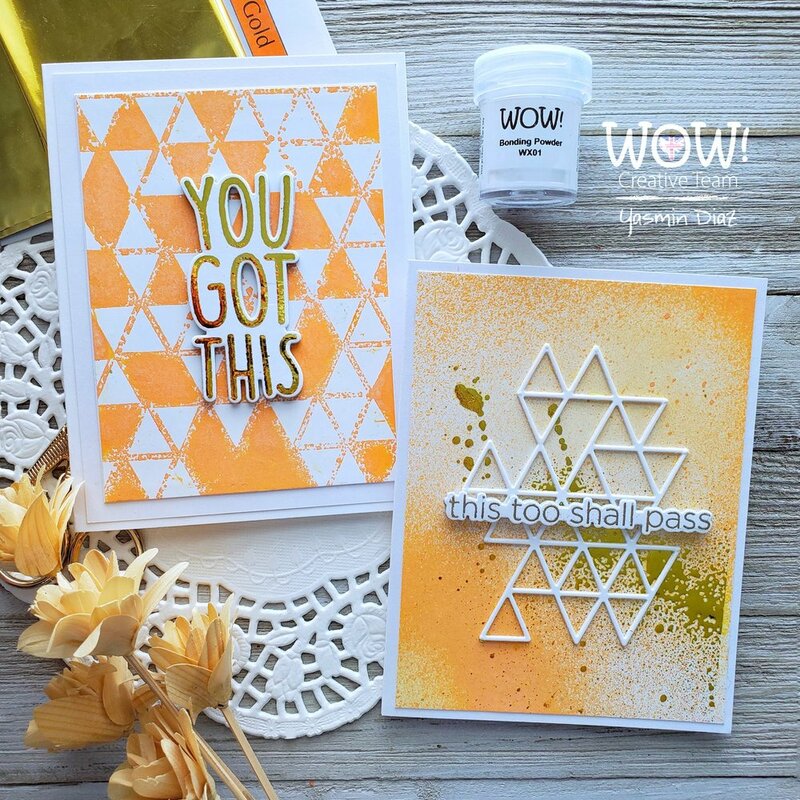 In the meantime I turned on the Minc Foil Machine with the right heat setting while I stamped the You Got This sentiment with the embossing pad in a piece of white card stock, after the stamping I applied all over it Bonding Powder which soon after I heat embossed it. Once the heat embossing was done, and the Minc machine was ready to foil I cut a piece out the gold foil sheet, and I covered the whole sentiment with it. Then I ran them through the Minc Machine by using the transfer sheet. Once the sentiment was foiled I used the coordinated die which I lined up to die cut it out from the white card stock, once I was done die cutting it, I decided to die cut it also from fun foam. After all the die cutting was done I started the layout for this card by adhering the inked background to a white card panel, as you can see I trimmed it down creating a white border. Soon after, I adhered the foiled sentiment to the fun foam, then I adhered it to the card panel. You can see the dimension from the fun foam in the picture above. Last but not least, to finish the card off I adhered the card panel to an A2 standard size white side folding card base. For the second example I freely sprayed the Distresses — Spiced Marmalade ink all over the white card panel, once the card panel had enough ink I set it aside to dry. In the meanwhile, I used the Triangle Element die to die cut twice out of white card stock the triangles. Also, I stamped with the clear embossing pad one of the sentiments from the same stamp set, which I gold heat embossed it. Once the heat embossing was done I used the coordinated die to die cut the sentiment twice once out of the white card stock, and the second time out of fun foam. By the time that I was done with the die cuttings, the card panel was already dried out. However, I decided to lightly sprayed it with the Minc Reactive Mist, as I wanted to give it a touch a shine to the card panel by adding foil to the splatters created from the spray. NOTE: I must mention that by spraying the reactive mist, I had it to wait until the spray adhesive was completely dry before I ran the card panel though the foil machine. After waiting a few minutes, I’d said it took between 15 to 30 minutes for the adhesive to completely dry, and as soon it was dry out I cut out of the gold foil sheet a piece bigger enough to cover the whole card panel, once the panel was all covered I ran it through the Minc machine to create the beautiful foiled splatters for the card panel. Once the foiling was done, I could have left it just as it was by adding the sentiment on top of it. However, I decided to adhere the triangle die cutting that I had previously die cut to the card panel along with the fun foam, and the sentiment. Last but certainly not least, to finish I adhered the card panel to an A2 standard size-white side folding card base. And here you have the cards. Side by side. I hope you’ve had a great time here with me, as always I appreciate the time you take to read the blog posts. Down below you’ll find the supply list for all the products used in this post, as a referral from where they were purchased from. I am creating this blog with the purpose of sharing how I design my cards, the information provided here is base in my own opinion and creativity. I am not an expert by any means, and I only share the way that I design my cards. All of the products used for this blog post were personally purchased by me. However, I did received the Fab Foil from WOW! Embossing Powder. — All of the referral links were added for you to know from where I purchased the items from. The products shared, and mentioned in my blog posts are simply because… I use, and truly love them.